Each December, Trinity works with Adopt-a-Child Size to help hundreds of families in need by providing full sets of clothing of children. Trinity members assist with shopping, organizing, transporting, and blessing of the donated items. During the Sunday offertory children are encouraged to drop pennies in a jar in the aisle at the front of the church to go toward the Adopt-a-Child size program. 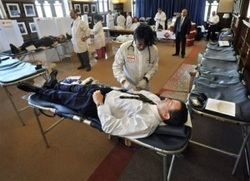 Trinity regularly hosts blood drives for the American Red Cross. Cedar Woods is a local assisted living facility which has been served by members of Trinity for over fifteen years. Once a month on Sunday afternoon, a team of Trinity members goes to Cedar Woods to minister and serve communion to residents of the facility. 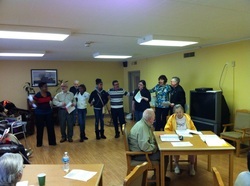 The team also provides a cake, refreshments, and cards to celebrate residents’ birthdays. In December, Trinity puts on a Christmas party where adult and youth members of the congregation join the team to sing Christmas carols, hand out gifts made by our children, and serve lots of food. It always proves to be enjoyable not only for the residents, but for Trinity members as well. Trinity accepts non-perishable food donations in a box at the back of the church to be taken to the Helping Hand food pantry in Romulus weekly. Several Trinity members have also used their considerable couponing skills to stretch monetary donations significantly further in the purchasing of food items for the pantry. 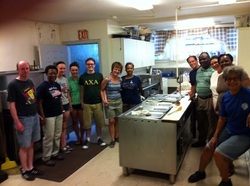 Parish members trek out to the Spirit of Hope soup kitchen in Detroit once a month to help to prepare and serve meals for the needy. Trinity also solicits and accepts clothing donations that are periodically taken to Spirit of Hope to help those in need.